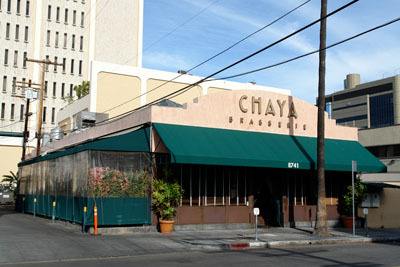 Chaya Brasserie is located in heart of WeHo (West Hollywood). Because of it’s proximity to popular places on Robertson boulevard like The Ivy, parking in the area can be difficult. A good way around is to use their valet parking. The restaurant is very comfortable with a nice Asian themed decor. While the decor is very nice, more attention should have been put to the acoustic of the place as it is very noisy for a restaurant. The service was very good. The staff made every effort to accommodate us. One thing, they could do with a bit more staff on busy nights like Saturday. As main course, we ordered 3 portions of the chef entrÃ©e selection to be shared between the 2 of us. The entrÃ©e selection included escargots cooked with mushrooms in a traditional butter parsley and garlic sauce, seared tuna sashimi, jumbo shrimp cocktail, egg rolls, fried calamari and shrimp rolls. This allowed us to tried a wide variety of food. Everything was very good with a special mention for the seared tuna sashimi that was clearly above everything else. As desert, we shared a desert sampler. The desert sampler included a molten chocolate cake served with a red fruits coulis, a coffee creme brulee and a kind of ladyfinger cake with chocolate and ice cream. Again, everything was very good. I particularly appreciated the molten chocolate cake. Around $50, including drinks (cocktail, sparking water, espresso) and tip. You should expect to pay a bit more depending on what you order. Still, considering the very hip neighborhood and the food, Chaya Brasserie offers very good value for money. I will definitely come back. 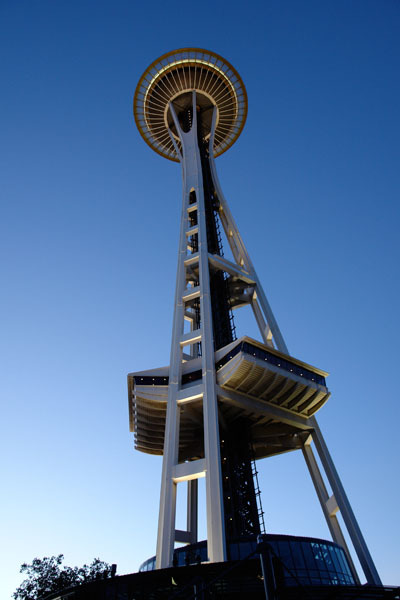 The location of SkyCity, on the top of the space needle is probably one of the best in Seattle. The view from that rotating restaurant is simply fantastic. The restaurant itself, with it 70s decor, is comfortable. On the down side, toilets are in the staircase, shared with the observation deck. The service was alright. Not only smiling is optional at SkyCity but we felt pushed out of the door: The bill arrived on our table, without been requested, as soon as the desert was served. As starter, I had the freshly prepared soup of the day. The soup, tomato and rice, was good but totally unexceptional. The kind that you will get in any decent dinner.As main course, I had the artichoke, fennel, mushroom, cipollini onion, sun-dried tomato sofrito and manchego cheese Tarte Tatin. The tarte tatin was served with a scoop of truffle ice cream. What I was expecting was a nice savory tarte, with nicely caramelized vegetables. Well, I was extremely disappointed. Not only the lack of salt is pretty evident but the amount of sugar used denies you any taste of the vegetables. The truffle ice cream is a low grade industrial vanilla ice cream mixed with with truffles. I would be really surprised if anyone is able to taste truffles in it. In one word: awful. Around $70, including drinks (ice tea and espresso) and tip. The minimum food charge of $35 per guest give you a clear sense of their priority: make money. Neither food or service are priorities at SkyCity. That place should definitively been avoided until a drastic change happen. In the mean time, if you want to enjoy the view, buy a ticket for the observation deck and bring your own food. 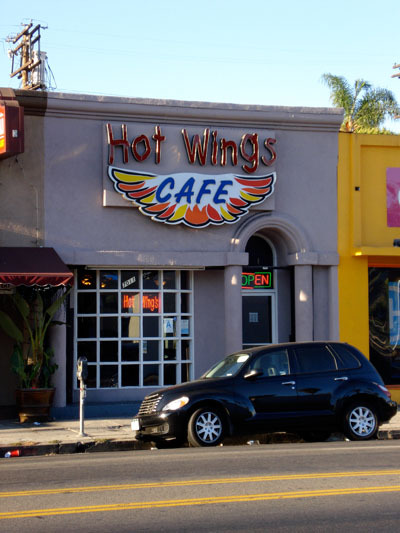 Hot Wings Cafe is located in the heart of Hollywood, not far from the very famous Pink’s hot dogs. The restaurant is very casual, so don’t expect much comfort. The decor could really do with an update. Additionally, parking is notoriously difficult in the area, mainly because of the proximity of Pink’s hot dogs. The service was good. While she’s not an accomplished professional, our waitress took good care of us and made genuine efforts to please us. Of course, going to a place named Hot Wings Cafe, we had Buffalo wings for dinner. The wings, served with curly fries were perfectly cooked, crispy outside and tender inside. The sauce was hot with the right amount of chili for me. I was feeling the heat while still able to continue eating wings. This is definitely the place to eat Buffalo wings in Los Angeles. Around $15, including drinks (beer) and tip. At $15, Hot Wings Cafe definitely offers very good value for money. If the decor put you off, you can still order wings to go. Copacabana is a very casual restaurant located in pike place market. 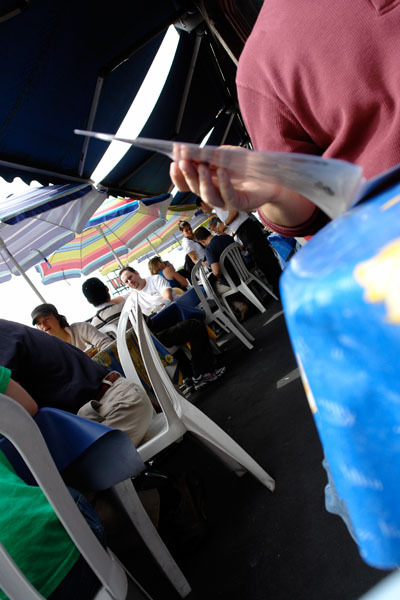 The tables are on a terrace on the first floor of a building, giving you a nice overlooking view of the market. The restaurant is very casual, so don’t expect great comfort here. Still, it really fits the bill as a market restaurant. The service was good. Our waitress made genuine efforts to please us. I ordered a paella. With the paella came a small salad as starter (lettuce, carrots and tomatoes). While the presentation of the salad was the most basic, it was good. The paella was very good. apart the shrimps that were a bit dry. Around $25, including drinks (sangria and espresso) and tip. Considering the food and the location, Copacabana is a good value for money. I will come back. Aux Pieds Dans L’Eau is a guinguette, a very casual outdoor restaurant near the Saone river. The location is great and perfectly fits the bill but don’t expect great comfort. One sour note, there is a train track nearby. Hopefully, trains are not that frequent. It took a bit of time for the aperitifs to come, but, apart that, the service was good. Our waiter was running all over the place to satisfy the numerous tables he had in charge. He probably could have done with a bit of help. I started with the PÃ¢tÃ© en croute (pate covered with a crust and cooked in the oven). The pate was served with figue jam and dry apricots. While rustic, it was very good.As main course, I ordered the quintessential guinguette dish: frog legs. If you never had frog legs, you’re probably have a vision very different from what the reality is. To be honest, it’s a bit like chicken. What make the difference is how you cook them. In this instance, the frog legs were cooked with the traditional garlic, parsley and butter sauce. While the meat was crispy on the outside and tender inside as it should be, the sauce was too oily and a bit too bland. Salt and pepper would have been helpful here. Good but somewhat disappointing. As desert, I had half of a Saint-Marcellin cheese. Saint-Marcellin is a small local cheese produce with non pasteurized milk. If you never had non pasteurized milk cheese, Saint-Marcellin is probably not for you. Simply served with a salad, it was a bit pungent and about medium strength. A bit more salad would have been nice but the cheese was exactly the way I like it. Around $30, including drinks (white wine and espresso) and tip. While you can probably find better value for money around, the overall experience was certainly pleasant. In a guinguette, food is not the most important thing, the atmosphere is. So, I’m on the fence with Aux Pieds Dans L’Eau. I may go back there. L’Auberge Du Pont De Collonges is located north of Lyon, on the banks of the Saone river. The restaurant is extremely comfortable. From the fine tablecloths to the crystal glasses, everything is, as you would expect from Paul Bocuse, perfect. In line with the French tradition, the service is very formal. Our waiters and our sommelier were continuously taking care of us without being overly present. When asked, they provided extremely detailed descriptions of the dishes and expert advice on wine pairing and cheese. My only disappointment was not be able to get a menu in English for my American friends. I started with the Risotto. The risotto was served with crayfish and a Nantua sauce (a crayfish based sauce). Both the taste and the texture of the risotto were perfects. The crayfish were extremely tender and their flavor was certainly enhanced by the Nantua sauce.As main course, I had the fillet of beef Rossini. The fillet of beef, topped by a piece of lightly seared foie gras, was served with vegetables and a PÃ©rigueux sauce (Madeira and truffles). The beef was so tender that I used a blunt knife rather than a steak knife to cut it. Perfectly cooked, it was juicy and flavorful. The foie gras and the sauce were a perfect complement. A judicious agreement with my left neighbor at the beginning of the meal allowed me to exchange part of my fillet of beef Rossini against some sea bass in puff pastry. The sea bass, cooked in puff pastry, was stuffed with tarragon and parsley. That fish, with it’s wonderful aroma of fresh herbs, was the best fish I ever had. Following the main course, we were offered a wonderful selection of cheeses, from soft white Cervelle de canut to mature Roquefort. I asked for an assortment that included my local favorite: Saint -Marcellin. All were perfectly aged. As desert, I had both woodland strawberries with vanilla ice cream and a burgundy cup. Woodland strawberries are very small, yet extremely flavorful, strawberries. The accompanying vanilla ice cream was actually the best ice cream I ever had. The burgundy cup is a selection of red berries dipping in a red burgundy wine based syrup. It is surprising how well berries and red wine go together. Around $200, including drinks (still water, white wine, red wine and espresso) and tip. While it’s a lot of money, I truly believe that it was well worth every penny. What we had was simply astonishing. I will definitely come back. Masala, conveniently located close to the convention center, is comfortable. The modern decor offers a few surprises like a flat panel TV in the toilets. You shall not lie to your customers. Our waiter inverted a lamb and a chicken order. Instead of fixing the mistake, he switched the dishes and lied, expecting that we wouldn’t make the difference between a korma and a rogan josh. There is no excuse for that. I started with a Mulligatawny soup. The soup, served with a poppadom, was fairly authentic. Although a bit too salty, it was very tasty. Following the soup, I had lamb dhaniwal korma with a side of pulao rice. On the good side, the pieces of lambs were a very nice cuts and the pulao rice was very good. But, while korma is usually very mild, this one was totally bland. Not what you expect from Indian cuisine. I had to opportunity to taste the chicken rogan josh and the chicken vindaloo. Rogan josh should be medium hot and vindaloo should be very hot but, as the lamb, both of them were totally bland. Around $40, including drinks (a mango lassi and sparkling water) and tip. Considering the food and the service, Masala is definitely not a good value for money. I will avoid that restaurant in the future. Located in the heart of San Diego, Grant Grill is both beautiful and extremely comfortable. The decor is modern and chic. From the tablecloth to the china, everything is perfect. I have only one regret: you have to go across the hotel hall to reach the toilets. The service was very good. We were accommodated quite late in the evening without a reservation. While our waiter wasn’t the best in the profession, he made genuine efforts to please us. I started with the foie gras. It was fresh foie gras, lightly pan fried, served with apple slices and grapes. Both the apple slices and the grapes (skinless) were cooked in the foie gras juice. In one word: delicious. As main course, I had braised oxtail, served with vegetables and a salsify puree. The oxtail was served as pieces, without bones or gelatine, sparing me all the tedious extracting work. Both the oxtail and the salsify puree were excellent. That combination create a very well balanced dish. As desert I had the fresh fruits clafouti. The clafouti was served warm in a copper dish, topped with a delicious home made vanilla gelato. It was the perfect ending to a wonderful meal. Around $70, including drinks (a glass of red wine, sparkling water and espresso) and tip. Grant Grill offers an excellent value for money. While $70 is a fair amount of money, it was worth every penny. 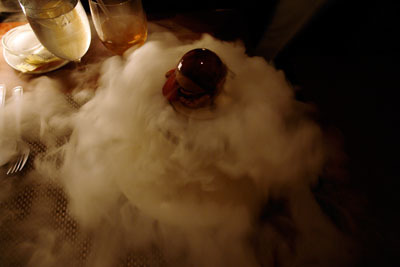 The location, the restaurant and the food are exceptional. I will definitely come back. 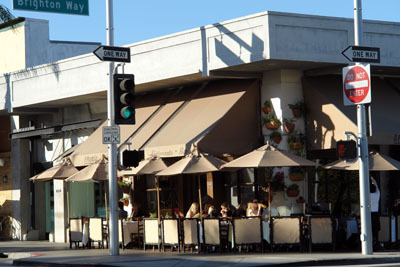 Il Pastaio is located in the heart of Beverly Hills, not far from Rodeo Drive. The restaurant is very comfortable. Tables outside are a bit cramped but let you enjoy the sun. Toilets are clean but could look better. The service was very good but with an attitude. Repeat customers seems to get a better treatment. As a main course, I had risotto al funghi. While I personally prefer thicker risotto, it was truly excellent. It wasn’t too rich and they were able to strike the right balance of cheese and mushrooms. Following the main course, I had panna cotta as desert. The panna cotta was served with fresh strawberries, a strawberry couli and some mint for decoration. Taste and texture were excellent. One fault: the mint decorating the panna cotta was not the freshest. Around $35, including drinks (orange juice, san pellegrino, cappuccino and espresso) and tip. It’s pricey for pasta but if you consider the location and the quality of the food, it is definitely good value for money. I will come back.